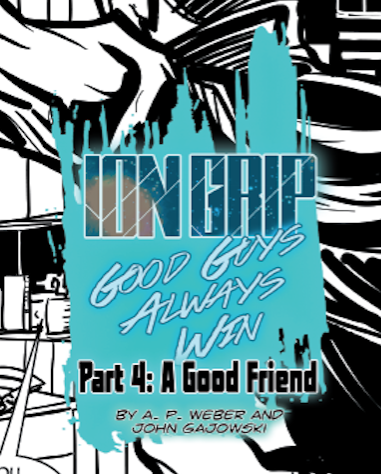 Maybe you've noticed the usual steady flow of new pages has come to a stop since the ION GRIP issue #3 cliffhanger. Well, we're a little behind, but we want you to know we're hard at work on issue #4. It's going to be a great, gut-wrenching wrap-up to the Good Guys Always Win story arc. And after that? Don't worry, we're not done with Agent Marion Grip. Here's some good news: issues #1-3 are now available in print! We'll be selling these bad boys at Eugene Comic Con, November 11th and 12th. Our table will be in the Gleason Atrium with Imagination International, Inc––find them, and you'll find us! Hope to see you all there! Comics, Comic Con, Print, Eucon, Eugene Comic Con, Ion Grip, iii, Imagination International, Imagination International Inc.